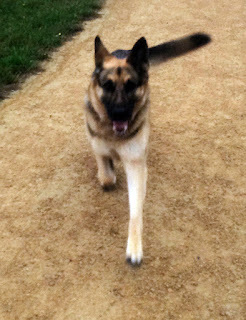 Police are looking for a dog (pictured right), and it's owner after it charged at a jogger in Cuddington Rec. This originally happened back in July and was reported to Sutton Council. However the same dog (with the same owner) ran at speed towards the same jogger early (around 6:45am) on Monday 31st August, from a distance of around 30 metres and only pulled up at the last moment. The dog then growled as it circled him. The dog owner apologised after this second incident. "Since it was the second such instance with this particular dog, I was fairly confident that it would not physically attack me, but nonetheless, there is always that element of doubt which makes it scary." A few days later the jogger was back in the park when he saw the dog again but this time the dog owner restrained the dog by its collar whilst he ran by. "There only has to be reasonable apprehension that a dog will injure or attack you for an offence to have been committed under the Dangerous Dogs Act. We would like this dog owner to come forward so we can engage with him and give him appropriate advice." If you happen to be the owner of this dog, please contact Sutton Police station on 101.